Almost 60 percent of America’s pet cats are overweight, according to a survey by the Association for Pet Obesity Prevention. Feline obesity can lead to joint pain, hinder self-grooming and make it harder to use the litter box, all resulting in fat cats being left at shelters by frustrated owners. Experts advise that a house cat should maintain the sleek, uid motion of a jungle cat. Viewed from above, healthy cats have a distinct waistline, an inward curve between the rib cage and hips. Pick it up and step on the scale. The pet’s weight should comprise between six to 10 pounds of the total. “The rst time I saw healthy cats, I thought they looked small because I’d become used to seeing fat cats,” recalls Traci Pichette, founder of Pumeli tea and gift boxes, in St. Petersburg, Florida. She’s not alone in her assessment. While free-feeding dry food is easier for owners and allows a cat to snack at will, some take advantage and overeat, often from boredom. 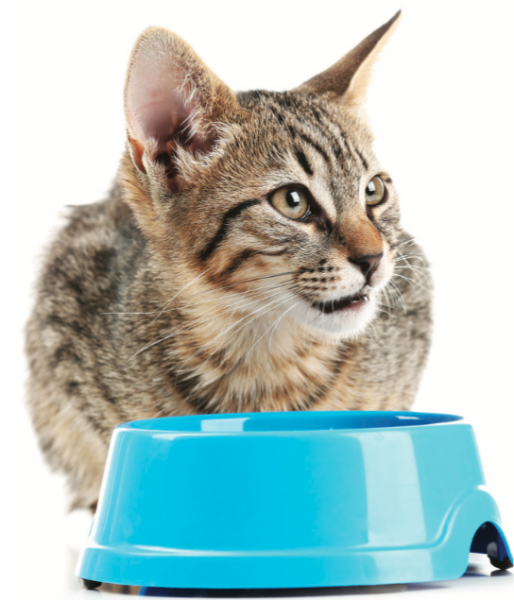 To help the transi- tion from always-available dry food to mealtime wet food, use kibble as a special treat. Food puzzles, widely available online or in pet supply stores, will keep Kitty busy during the day. Homemade feeding puzzles work, too; put a small amount of kibble in a cardboard tube or small box, tape the end shut and randomly cut small holes in the sides. Kitty will have to roll the tube or t a paw inside to retrieve a treat. Cats are obligate carnivores, which means their natural diet comprises 90 percent meat and 10 percent vegetable matter. A roaming cat’s native routine is to search for food, hunt, catch and eat, groom and nap. Because each catch is small, they eat frequently. While the family’s morning and evening schedules mean just a quick scoop of food in the bowl, the third meal should be an interactive one. “A battery-operated toy or waving a laser light around is not play,” says Galaxy. “Interactive play is not texting with one hand and wiggling the shing pole toy with the other. You have to get up and move to let the cat search for the toy, watch and wait, then pounce. It engages the animal mentally and physically and brings the raw cat to the surface. 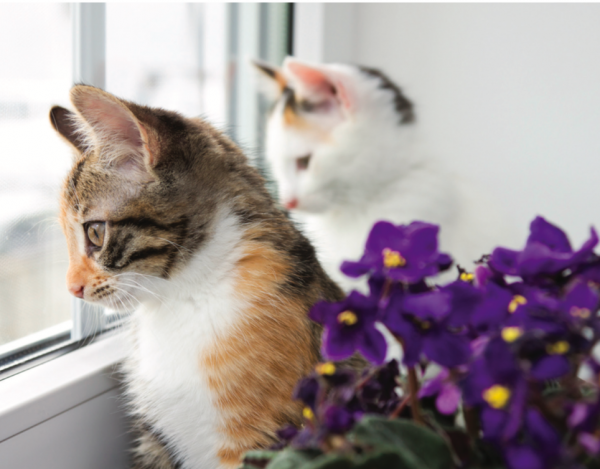 When you reach the point of diminishing returns, the pet is tired and it’s time for a meal.” His foundation improves lives of shelter animals, teaching staff to clicker train, entertain and exercise their cats to make them more adoptable. Connect with freelance writer Sandra Murphy at StLouisFreelanceWriter@ mindspring.com.